*DVD available. Email for more info! Click here for a sample clip from Gulliver's Travels (requires QuickTime). Gulliver's Travels, an original musical adaptation of the political adventure book by Jonathan Swift. The story tells the of journey of Dr. Lemuel Gulliver, detailing his visits from Lilliput to Brobdingnag and beyond. There are a number of exciting characters from the original pages, including Gulliver's dealings with The Pirate Captain (Pirates are Really Nice Guys) after he escapes the land of the little people, to the Island of Sorceresses where he meets all sorts of historical characters and has a chat with Julius Caesar, who tells the real story of what went down with Brutus. Each of the lands visited by Gulliver represent a different side of humanity. By travelling to each land Gulliver discovers humanity as a whole. At the Island of the Sorcerer he discovers that the journeys he has experienced are all connected to the human struggle. In the end, the audience is given the choice at Houhnym court to decide if he is a Yahoo (Barbaric) or Houhnym (Compassionate). Video Clip: What is he inside? We find that he is neither, but rather, like most of mankind, is somewhere in between: not Yahoo and not Houhnym...simply human. 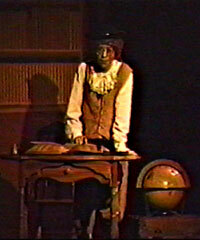 Gulliver received its first production in 1994 at The Concord Youth Theater and songs from the show have been included in subsequent revues and concerts throughout the years. Pinocchio, an original adaptation of the classic tale retold with jazz, blues and funky pop music by a host of characters that include a hip cricket, a vaudevillian fox, and a Fosse-esque whale. Pinocchio learns how to be a real boy by being real with the people in his life. Pinocchio has been produced five times over the past decade with the Concord Youth Theater; Impact Arts Events Group in Connecticut; and through a Massachusetts Cultural Arts Grant in the Western Massachusetts Library system.